Topic: Past WX stations owned? Re: Past WX stations owned? Lacrosse 2317 for years and got tired of parts dying. Davis Vantage Vue with Pro2 console and Wifi Logger to dedicated PC now...runs great even in the Phoenix heat! I see the Toys for Weather book. Lots of ideas in that. As a kid in the late 50s early 60s my parents took some hard earned money and bought my brother and me a Reader's Digest book of projects. One of the things was to make your own instruments. Being fascinated by anemometers (moving things that were bright and shiny?) I made one out of tinker toys and learned how to carefully cut a ping pong ball in half. Calibration was tough. And then found a selsyn motor for a remote reading wind direction, and convinced the high school science teacher to let me blow a glass column for a barometer, and he gave me enough mercury to fill it, but it wasn't nearly as neat as the commercial one with the little vernier to do 1/100ths of an inch of the column. the biggest project was using a milk carton (which we didn't have since we had our own milking herd on the farm) and a straw, with a long blonde hair for a hygrometer. The worst part was getting up the courage to ask the ONLY blonde girl in school with long enough hair to be usable for the project, for some of her hair. It actually worked quite well. I got a Taylor Max/Min thermometer (the U shaped tube with the magnet to reset the sliders) for a Christmas present, and somewhere along the line a Taylor hygrometer with the wet bulb always wet from a little glass tube along the bottom. I recorded data every day, and somewhere I still have the notebook, along with comments on rain and snow measurements. then my older brother who by then was running the farm, built a shop and 'office' in which he put a nice Taylor wind direction and speed indicator, the old black outside pieces and the wooden box with the meter that bounced up and down with the gusts and the direction indicator which needed batteries to work. The sickness was really starting to grab hold by then. Never did I think that the string of home-made and then when I could earn enough money to buy Heathkit stuff 1290, 4001, 5001 and then on the the breathtaking Vantage Pro (1 but it wasn't called one at that time) and since then all sorts of rag tag stuff. My wife will be sad and happy when I die, but isn't sure how to get rid of it all. The old saying comes to mind (especially with the RM Young, Vaisala, Peet Bro, Campbell Scientific stuff) that my greatest fear is my wife will sell all of it for what I told her I paid for it. Neat. Can someone post pictures of the 1960's Lionel weather station? I tried Googling but not really sure what I'm looking for. That is really cool to see. Thank you for the pictures.Love those product marketing photos where the marketing people don't understand the product. What is the kid doing turning a dial when the station isn't even set up? But I guess you just have to be interacting with the product physically or it isn't exciting. And why are there two anemometers in the picture? And they could have stood up the rain gauge. Wonder if the map on the wall was included? Amazing how far technology has come. Just think future generations will probably have their own 3D doppler radar and who knows what else. I thought that I would post a couple of photos from my One-Wire vintage setup. I rebuilt the wind set and gave it to my SIL, he gave it to his nephew. As far as I know, it's still in use. 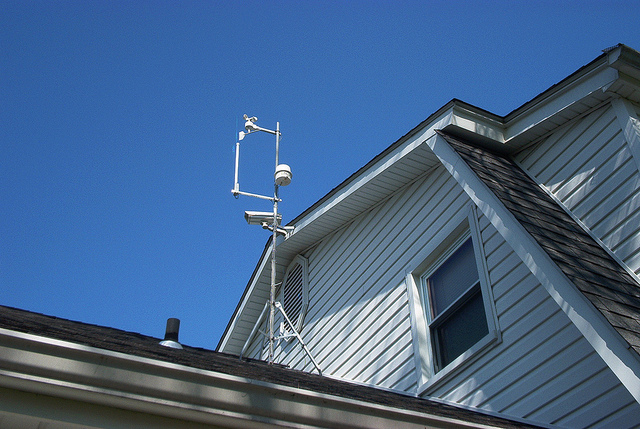 This picture shows the One-Wire rain gauge, anemometer/vane, and lightning detector. There is also a camera in the housing just under the weather equipment. 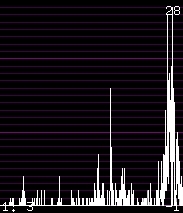 This plot is how I was able to view lightning counts from the One-Wire lightning detector. You can see the approach and departure of a storm near the right side of the plot. My first weather station was a childrens kit, with a cardboard display with four neon bulbs for direction and one, which blipped with every revolution of the anemometer. The wind speed was calculated by the number of "clicks" in a minute. Went from there to a Taylor Windscope but had constant problems with it so upgraded to a Maximum wind cube. Then, in the mid 70's, I was invited over to Texas Electronics in Dallas for a tour and they gave me surplus parts to build my own wind station. It was awesome. Since then, I have stuck with Maximum and Davis. I currently have a Maximum set for wired wind performance and a Davis VUE for all other, wireless parameters and a COCORAHS rain gauge for back up. My First was made by Maximum Inc and was called WeatherMax. I actually still have a spare one unused in the original Box Stored away in my Closet. Weathermax was a CABLED System. I bought mine back in 1995, price at the time was around $525.00. I used it from 1995-2007. In 2007 purchased a Vantage pro 2 and around same time got heavily involved with learning Weather Display software and learning how to make a weather Website. Website has been online now since 2007-present. Took many long nights of trial and error and also some very good help from many other members of the weather Forums to get everything to where it is today. Currently I am using Davis Vantage Vue with Meteobridge Software.